Smooth, cost-effective ceramic sleeves, bonded to impact-resistant rubber, bonded to the inside of pipe. SUPERPIPE is an innovative pipe design with a interior ceramic surface that is smooth without the uneven interior surface typical of pipe lined with traditional ceramic tiles. The result is a durable pipe system that will reduce pumping costs and provide the lowest cost per delivered ton of product compared to other lining systems available in the marketplace. When your slurry piping requirements demand a robust, long-life ceramic lining combined with low hydraulic losses, Corrosion Engineering SUPERPIPE is the solution. The interior surface of a SUPERPIPE pipe spool or fitting is smooth without the uneven interior surface typical of pipe lined with traditional ceramic tiles. The multiple ceramic tubes comprising a long pipe spool lining are precisely installed to ensure concentricity and negligible turbulence at joints between tubes. Corrosion Engineering’s proprietary installation process ensures tube-to-tube concentricity and eliminates the need for interior tooling during the installation and vulcanization of tubes. 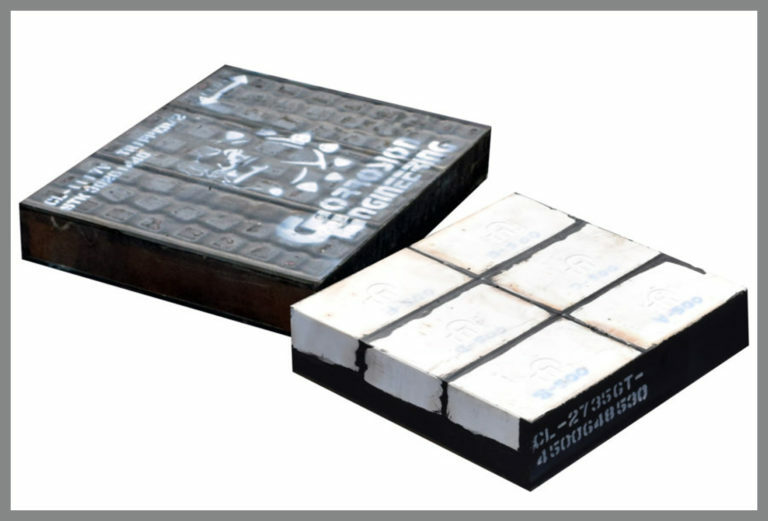 The result is a smooth, durable ceramic lining that will reduce pumping costs and prove the lowest cost per delivered ton of product compared to other lining systems available in the marketplace. SUPERPIPE ceramic lining can be applied to straight spools, mitered sweeps and elbows, tees, reducers, and laterals. The steel spools and fittings for SUPERPIPE are fabricated by Corrosion Engineering specifically to accept SUPERPIPE ceramic lining tubes. All SUPERPIPE ceramic lining is vulcanize-bonded to the interior of the pipe utilizing natural and synthetic rubber compounds specifically selected for the application and the operating environment. SUPERPIPE ceramic-lined pipe and fittings are custom made for each application, permitting us to vary pipe wall and ceramic thicknesses. When SUPERPIPE is installed in an existing system, we can match the inside diameter or SUPERPIPE to the existing pipe to minimize turbulence and wear. SUPERPIPE ceramic-lined pipe and fittings can be fitted with a wide variety of connection types, including forged flanges, AWWA C207 flanges, AS2129 flanges, grooved couplings, and others. Lap joint flanges are frequently provided on one or both ends to eliminate flange indexing problems, especially in existing pipelines. To accommodate very thick ceramic lining, piping can be oversized by one pipe size and reducing flanges can be provided to match existing piping. Corrosion Engineering ceramic-lined chokes and orifices are specifically designed for extreme slurry applications. These chokes and orifices are highly resistant to corrosion and 20 times more wear resistant than steel.